We are on 85th Street off of 2nd Avenue, where we see FDNY Engine 22, which is housed with Tower Ladder 13 and Battalion 10, as it goes on an undisclosed EMS run to 405 East 92nd Street. Today, Engine 22 is utilizing a spare rig, due to the fact that their regular rig was in the shop. This one is a 2000 Seagrave Pumper with a 1000 gallon tank. 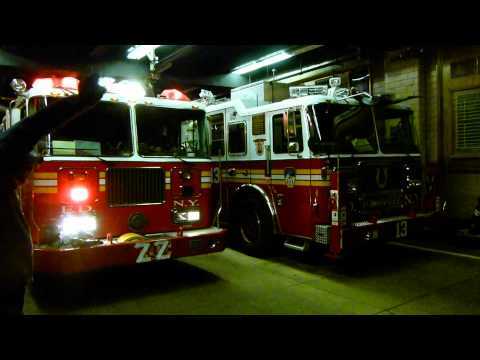 Tower Ladder 13 is a 2010 Seagrave, and Battalion 10 is a 2009 GMC. Enjoy the sight of one of the older engines still in use, albeit as a spare. If you have any questions about the video, feel free to message me. Comments are welcome. The video was taken on January 20th, 2012.